Houghton Mifflin Harcourt, 9780470437025, 528pp. In Baking Style, the award-winning author of Baking by Flavor and ChocolateChocolate, presents what has fascinated her during a lifetime of baking. In 100 essays and more than 200 recipes, along with 166 full-color images, Baking Style is infused with discoveries, inspirations, and exacting but simple recipes for capturing the art and craft of baking at home. Lisa Yockelson is the award-winning author of Baking by Flavor and ChocolateChocolate. Her articles, essays, and recipes have appeared in national publications such as the Boston Globe, the Washington Post, and Gastronomica: The Journal of Food and Culture. At her interactive website and blog, bakingstylediary.com, she continues her art of essay-writing and recipe development for a welcoming community of bakers. 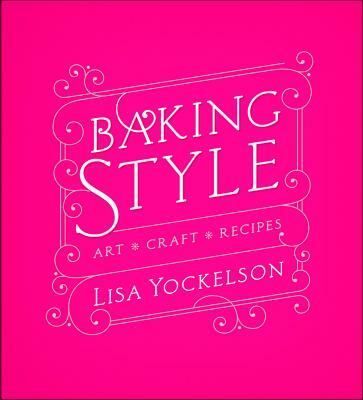 Baking Style combines the genre of the culinary essay with recipes, their corresponding methods, and illustrative images, revealing Yockelson's uniquely intimate expression of the baking process. LISA YOCKELSON is a food writer for both the Washington Post, the Boston Globe, and the New York Times and has contributed recipes and essays to publications including Gastronomica: The Journal of Food and Culture, Chocolatier, Pastry Art & Design, and Cook's Illustrated. Her Gastronomica article "Brownies: A Memoir" was included in Best Food Writing 2002. Yockelson is the author of ten cookbooks, including ChocolateChocolate (2005), which won The International Association of Culinary Professionals' (IACP) Award for Bread, Other Baking and Sweets category and was nominated for a James Beard Award in 2006, and Baking by Flavor (2002), which won the IACP Award for Bread, Other Baking and Sweets category and was nominated for a James Beard Foundation prestigious award in 2003. She is a graduate of the London Cordon Bleu.